India is the Second Largest Source of Components Used by the Islamic State to Make Explosives. IED components are commercial goods that are not subject to government export licences. In an exclusive interview by Shelley Kasli, Marcus Wilson, Managing Director of London based organisation Conflict Armament Research reveals to GreatGameIndia how in a 20-month investigation they managed to trace the supply chain of components used in ISIS IEDs and how India is their second largest source of components. Since July 2014, Conflict Armament Research (CAR), an independent London based organisation mandated by the European Union to investigate the supply of weapons into armed conflicts, has worked in concert with Iraqi and Syrian forces to document materiel recovered in military action against IS forces. CAR documented the components following their recovery during major battles around the Iraqi towns of al Rabia, Kirkuk, Mosul, and Tikrit and the Syrian town of Kobane. The investigation found that IS forces have manufactured and deployed improvised explosive devices (IEDs) across the battlefield on a quasi-industrial scale. Made of components that are cheap and readily available, IEDs have become IS forces’ signature weapon. Their chains of supply differ from those of military weapons. For the most part, IED components are commercial goods that are not subject to government export licences and whose transfer is far less scrutinised and regulated than the transfer of weapons. CAR has identified 51 commercial entities and 20 countries involved in the supply chain of components used by IS forces to construct IEDs. The companies produced, sold, or received critical material, such as chemical precursors, detonating cord, detonators, cables, wires, and other electronic components. 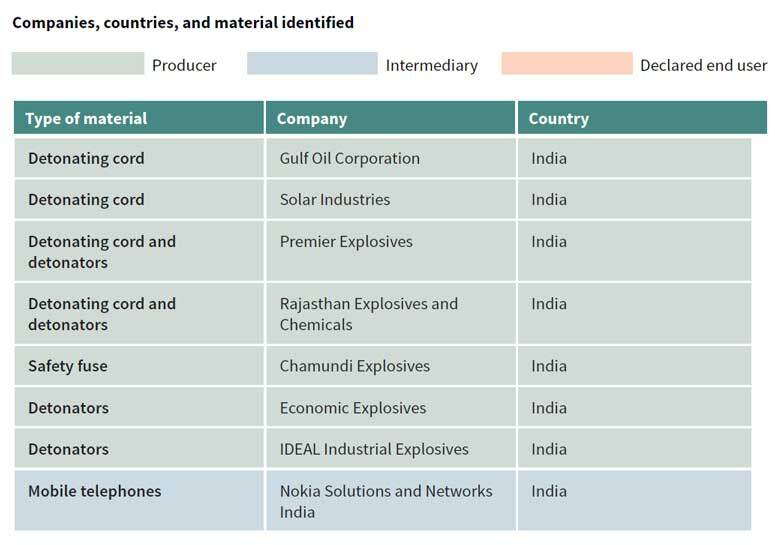 Seven Indian companies figure in this list that are involved in the supply chain of over 700 components used by the Islamic State to construct improvised explosive devices (IEDs). These Indian companies manufactured most of the detonators, detonating cord, and safety fuses documented by CAR’s field investigation teams. Under Indian law, transfer of this material requires a licence. All components documented by CAR were legally exported under government-issued licences from India to entities in Lebanon and Turkey. India is the second largest source of components used by the Islamic State to make Explosives. IED components are commercial goods that are not subject to government export licences. In an exclusive interview by the GreatGameIndia, Marcus Wilson, Managing Director of Conflict Armament Research reveals how in a 20-month investigation they managed to trace the supply chain of components used in ISIS IEDs and how India is their second largest source of components. GreatGameIndia: Tell us about the research you conducted and how you went about it? What kind of challenges did you face during your investigation? Marcus Wilson: CAR has had field investigation teams on the ground in Iraq and Syria for the past 20 months. These teams are embedded with local Peshmerga and YPG forces in Iraq and Syria to document recovered weapons, ammunition, and material used by IS forces. Details of recovered material are documented, researched, and the companies and governments of manufacture contacted in an effort to shed light on to the chain of custody – from manufacture to capture. Detailed examination of the evidence has led us to the reported conclusions. The biggest challenge we face, other than the obvious issues of working in an active war zone, is access to captured stocks. For this we are forever thankful to our local partners on the ground. GreatGameIndia: How does this entire supply chain and work? How specifically it works for India? Marcus Wilson: We can only determine the chain of supply to a certain point. Beyond that, we are at the mercy of the information provided by the companies. What we know is that Indian companies sold product to Lebanon and Turkey. These intermediaries then sold these products on to various customers in the region, and somehow, these items ended up in the hands on ISIS in Syria. Right now, we cannot determine the chain of supply beyond Lebanon and Turkey. GreatGameIndia: What kind of materials are used by ISIS in making IEDs? Which of these materials are procured from Indian companies? Why do they need to procure these materials from different countries? Below is the information compiled from the CAR report on materials made by Indian companies that were used by ISIS in making IEDs. IS forces regularly employ detonating cord in their IEDs to complete the explosive train between the detonator and the main explosive charge. The examples documented by CAR are commercial variants, which are used in both the mining and industrial sectors. 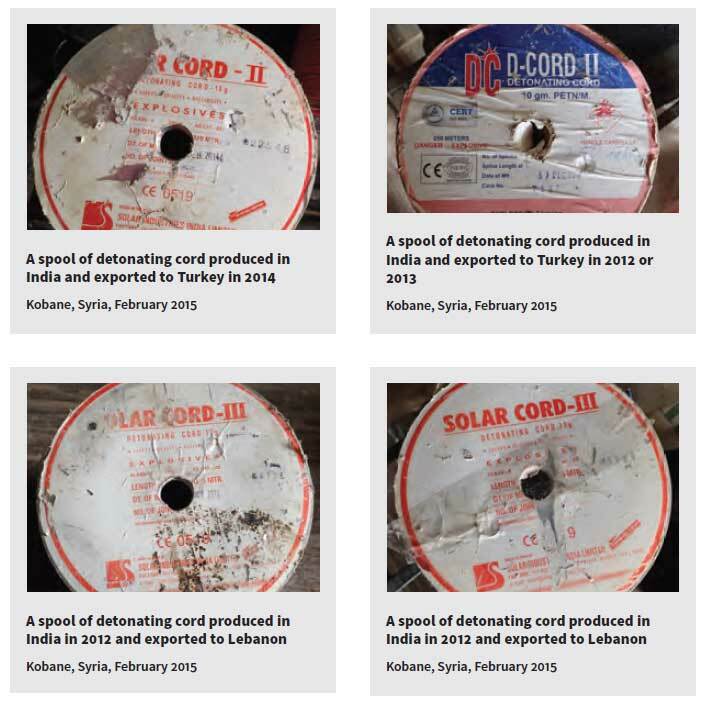 Solar Industries, India, produced one spool of detonating cord on 27 February 2014 and exported it to the Turkish company İlci, Ankara. Two months earlier, on 31 December 2012, the Gulf Oil Corporation, India, had produced a spool and exported it to the Turkish company Nitromak Dyno Nobel, Ankara. Solar Industries, India, produced a further two spools, on 21 and 23 October 2012, and exported them (on an unspecified date) to the Lebanese company Maybel, headquartered in Beirut. CAR also documented the use of Solar Industries detonating cord by IS forces on the Makhmour front line in Iraq at the end of 2014. There is no evidence to indicate to which regional entity Solar Industries supplied the cord. 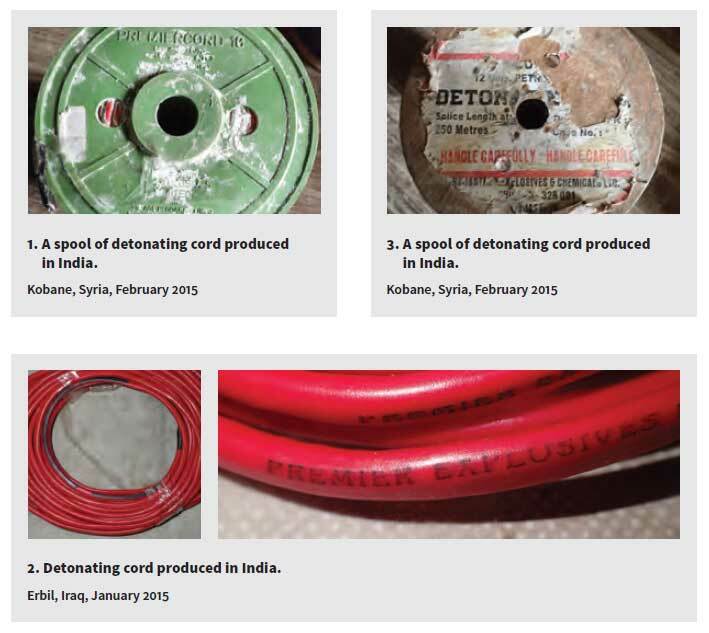 On 24 February 2015, a CAR field investigation team in Kobane documented a spool of detonating cord produced by Premier Explosives Ltd., India. 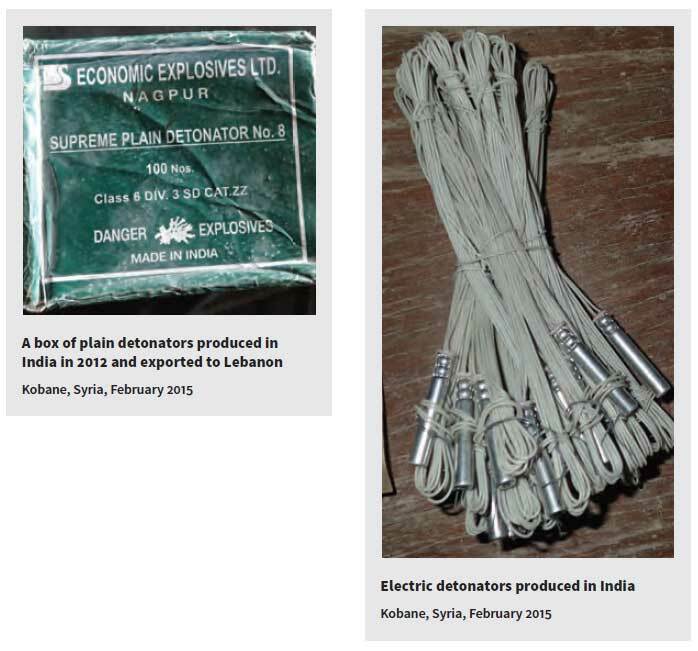 Premier Explosives has confirmed that it sold 6 million metres of detonating cord to the Mechanical Construction Factory, Syria, in 2009 and 2010. The team also documented a spool of detonating cord produced by Rajasthan Explosives and Chemicals, India and also a spool of safety fuse produced by the Indian company Chamundi Explosives. IS forces employ a combination of electric and non-electric (plain) detonators during the fabrication of their IEDs, fuses, and improvised weapon systems (such as rockets, rocket-assisted mortars, and other improvised projected weapons). YPG forces captured electric detonators manufactured by an Indian company Economic Explosives on 25 December 2012 and exported them (on an unspecified date) to the Lebanese company Maybel, Beirut. 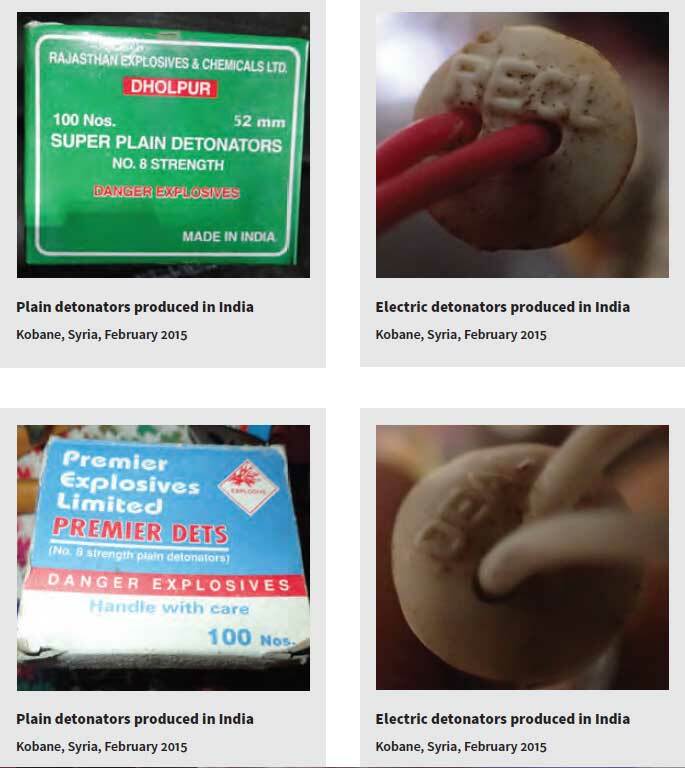 At the same location, CAR field investigators observed plain and electric detonators produced by Rajasthan Explosives and Chemicals, India; plain detonators produced by Premier Explosives, India; and electric detonators produced by IDEAL Industrial Explosives, India. GreatGameIndia: Do the companies you managed to track down know that the materials they manufacture end up in the hands of ISIS? Marcus Wilson: We do not believe, nor do we suggest that, any of these companies knew that ISIS would get hold of their products. They only know now after we notified them of the existence of their products in ISIS hands. It’s unlikely they had no knowledge before this. There is no evidence to suggest, nor does CAR in any respect imply, any direct transfer of goods to IS forces by Indian companies. GreatGameIndia: How could governments/companies go about solving this problem? What do you suggest India should do on its part so as the materials manufactured in India do not reach ISIS? Marcus Wilson: With regard to governments, we would like to see those cited in the report have conversations with the companies involved and encourage them to cooperate with CAR’s investigations in order to avoid such cases occurring in the future. In India’s case, where the products are specifically explosive devices used for legitimate industrial uses, there should be greater scrutiny of the chain of custody to guard against these items getting into ISIS hands. GreatGameIndia: On a broader note, there have been many consistent reports regularly of weapons from various countries falling into the hands of ISIS; with Russia and other EU countries accusing the west for co-ordinating it. Do you suppose such a supply chain exists for manufactured weapons as well? Marcus Wilson: From other investigations in Iraq and Syria, we have found evidence of the various nature of supplies of manufactured weapons to ISIS forces. See CAR’s reports on our website. Few appear to grasp the full scope of what is happening in Syria. While plans are under way for the partition of Syria, for the first time in history the People’s Republic of China is flooding the Levant War Zone or Middle Eastern Conflict Theater, where the ISIS (ISIS/ISIL/DAESH) terrorists with the help of Saudi Arabia are trying to disrupt and destroy both Iraq (surprisingly it is called as Kuru in the local language) and Syria (locals call this Surya) and on the way demolishing all the cultural and archaeological treasures. The Chinese have correctly assessed that the most despotic, murderous and avarice state ever founded, Saudi Arabia and their brand of Wahhabi Islam with the full backing and support of certain western powers is a major threat for civilizational existence in the near future. China also correctly assessed that eventually these ISIS terrorists will enter China and disrupt their progress and development and that these terrorists will be used by every western nation that want to control the resources of China. So, joining Russia to support the Assad regime China has sent the most feared and deadly Special Forces belonging to Shenyang military region called the Siberian Tigers and the dreaded Night Tiger Special Force Units belonging to Lanzhou Military region. This follows a declaration by China of passing the first antiterrorism law authorizing the Chinese army to take part in counter terrorism measures anywhere in the world. 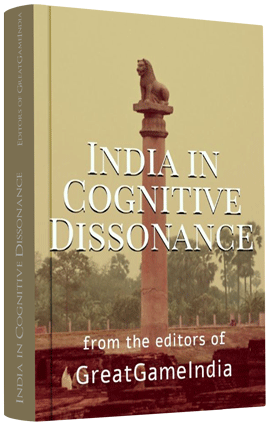 Though during the last one year we wrote extensively about ISI, CIA, ISIS and MI6 links to terrorism activities in India including the recent Pathankot attack, still we have to see a coherent, strategic and long term comprehensive response from either India or Pakistan.